Yes, I’m a little biased, but I think that yoga is the perfect form of cross training for runners. Not only will running help you be a physically stronger runner and resist getting injured, but it also helps you become a mentally stronger runner, too. But what’s the smartest way to add yoga into your training schedule? 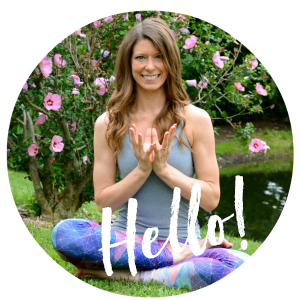 Here are my biggest tips for adding in yoga as cross training. First things first: you need to consider your goals, for running and for yoga. You need to make sure the two compliment each other. Is your goal to build strength through yoga? You should aim to do about 30-60 minutes of strength-building yoga like power yoga two to three times a week. Just like running or any other strength training routine, your body needs a consistent stimulus to build muscle and get stronger. If you only practice yoga once a week, you won’t see the results you’re looking for. Are you trying to increase your mobility so you can have a better range of motion? I’d recommend 10-15 minutes of gentle yoga at least 5 days a week, ideally every day. Flexibility takes time to build. And, when you go on another run, your muscles start to tighten back up. So, if you’re just stretching once or twice a week, you’re not going to see any changes. If you really want to focus on flexibility and mobility, you need to be working on it on an almost daily basis. If you’re in the middle of your training and you’re just feeling totally beat up, don’t push through and do a hard yoga class. You’ll run the risk of hurting yourself. (Yes, you can definitely get injured doing yoga.) It’s really important that you pay attention to the signals your body is sending to you, especially when it comes to yoga. If your body is telling you it needs a day off, some foam rolling mixed with a little gentle yoga could be perfect. You’ll help get the blood flowing through your muscles, which can help with recovery. You can even add in some recovery yoga poses for runners. Don’t push it, though. Runners tend to think that more is better, but when your body needs a break, more will get you injured. Smart runners rest when their bodies need rest. 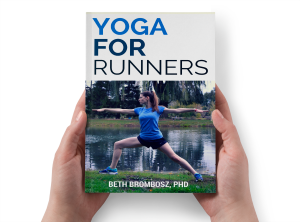 Questions about yoga for runners? Leave ’em in the comments, or email me! I hurt myself during yoga so I know it’s true! I prefer flow classes or a yin/yang class so I get a mix. Hmm… so what you’re saying is I’m not doing enough yoga. I see what you did there. 😉 But what if I’m using yoga for working on balance and stability AND for recovery after a long run? Is once a week okay? Love this post Beth!! The girls at our HQ have recently incorporated yoga into our running routine too. We’ve all seen some great benefits already! It also definitely helps clear the mind – which is great when you need some time to think about your goals. I always say I need to start doing more yoga. I do not like the breath in breath out relaxation stuff, but the stretches are really good. Especially after running.